For the sixth year in a row, Cuba has reported success in reducing its child mortality rate, reporting five deaths for every 1,000 births, according to local media Wednesday. The numbers come from a new report released by the Cuban health department, noting this year’s results of the Mother-Child Program. The program has proved successful because of the Medical Genetic program, which since 1983 has been revamped and improved, as well as the country’s Immunization program, which distributes 11 different vaccines to children for 13 preventable diseases. Health officials say this is the sixth year in a row that Cuba has seen under 5 deaths per 1,000 births, a number that ranks lower than both Canada and the United States, say officials. “This has contributed to the fact that, for several years now, the Caribbean nation exhibits an infant mortality rate below five, lower than the one of developed countries like the United States and Canada,” said the Cuban News Agency Granma. According to statistics by the World Health Organization in 2013, the United States stood at 5.2 child deaths per 1,000 births and Canada stood at 4.78. The Cuban Health Ministry also reported that for the fourth year in a row more than 1 million surgeries were performed throughout the country, and some 7,000 Cubans were beneficiaries of complex treatments such as cell therapy in regenerative medicine, orthopedic disorders, angiology, orthopedics and dentistry. Cuba’s public health care system is focused on preventative medicine and is renowned worldwide for its excellence and efficiency. 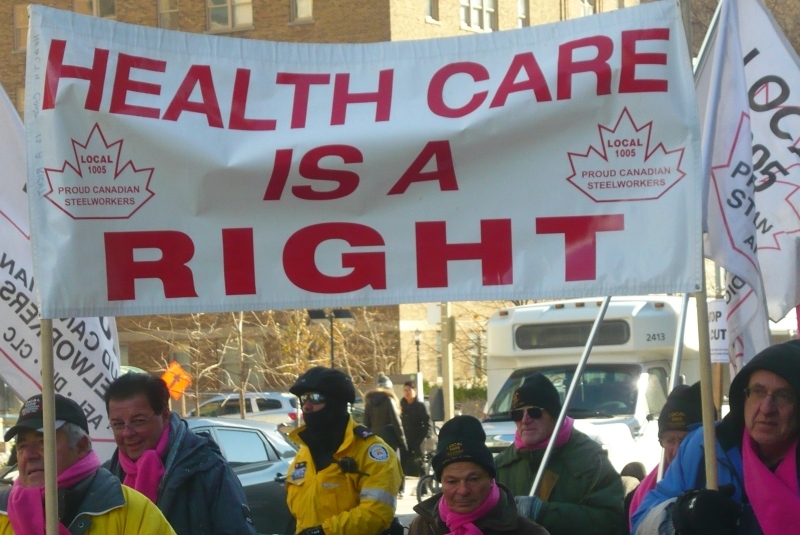 At a Feb. 15 People’s Voice public forum on the topic “Health Under Attack”, Brampton, Ontario residents spoke out strongly against austerity policies in the health care sector. Among the speakers at the forum was Doug Allan, a researcher and board member of the Ontario Health Coalition. Allan said that globalization of finance capital since the late ‘80s has created havoc worldwide, including accelerated privatization of the public sector. Private capital has systematically targeted the health sector to created a deliberate crisis, so that hospitals and related health facilities could be handed over to corporate interests. Both Liberal and Tory governments have collaborated to create a mess in Ontario’s health sector. These changes started under the social democratic NDP government of Bob Rae, Allan noted. Provincial and federal governments are consistently working to withdraw various medical facilities from public hospitals, and shifting to private “for profit” facilities where users pay hefty fees. To implement these anti-people policies, the ruling class has consciously defamed workers’ unions. Allan said that governments have tried to cut MRI and CT scan facilities from public hospitals, but had to restore some services when the Ontario Health Coalition and related unions resisted this move. Unfortunately, Allan said, the trade union movement is not as strong as it used to be in the 1960s, 70s, and 80s. Today, the offensive by big capital has to be confronted with strong unions, which need to devise new strategies by combining their efforts with the wider community. Trade unions must find ways to relate their activities with the communities, and create broad mass support to educate working people about the danger of the ruling elite’s plan for massive privatization. Another speaker, Shamshad Elahee Shams, explained the economic scenario of Ontario which plays a vital role in the Canadian economy. Thirty-eight percent of Canada’s 33.6 million people reside in Ontario, including 6.55 million in the Greater Toronto Area (GTA) alone. Ontario produces 37% ($695 billion) of the total Canadian GDP of $1.893 trillion. The GTA and Ontario are witnessing rapid population growth, but Ontario is the lowest province in terms of what it gets in services per capita. The zero percent rise in Ontario’s health budget in the last three years is a testimony of a government that doesn’t want to carry the social responsibility of the state. Over 18,500 beds were cut from its public hospitals since the 1990s. Public hospital spending per capita in Ontario was only $1372 in 2012, way less than the $2519 figure for Newfoundland and Labrador. Overall, Ontario’s health care spending stands eighth among the ten provinces, an average $3963 per person, compared to $5399 for Newfoundland and Labrador. Allan called on the people of Ontario to fight for their basic human right, since health is a state responsibility, and no mature civil society can tolerate this passive attitude of government. Community and communist leader Harinder Hundal gave a detailed example of the recently built hospital in Brampton. The government had promised a 600 bed hospital, but ended up with only 300-plus beds, and the cost of construction far exceeded budget projections. Hundal announced that members of the Communist Party of Canada, the Indo Canadian Workers Association, the Rationalist Society of Ontario and other organizations will hold a demonstration on April 12 in Brampton to show that people here will no longer tolerate the austerity measures of ruling elite. We will teach them a lesson, as the Greeks did in recent elections, he said. Human rights activist from Nepal, Govinda Shivakoti, said there will be no difference between a third world country and Canada if the education, health and social welfare facilities are withdrawn. Canada’s social safety net, won by the hard work and sacrifices of the working class, is an achievement that cannot be compromised, he said. Political activist Harparminder Gadri shared his personal experience of being billed for some blood tests which were earlier covered by OHIP. Now people are made to pay for services which had been free. Even sunglasses were covered in the 1960s by OHIP, but now vision care is left at the mercy of private clinics, where people are forced to pay over $200 for their reading glasses. Finance capital, he said, is on their high horses since the demise of the USSR, creating havoc in every third world country. Gadri cited examples from India, where new economic policies of various governments at the center systematically destroyed the public school system in the interest of the private schools. They have almost dismantled government hospitals which had a high reputation in the 1970s. Since then, the health sector is left to private, for-profit hospitals. The International Monetary Fund (IMF) has through its strict lending policies contributed to the Ebola crisis, professors from three British universities have charged. In a report published online last week in The Lancet Global Health the four researchers lay out how conditions the organization imposed on Sierra Leone, Guinea and Liberia–the three countries hardest hit by the virus–in order to accept loans put further burdens on local healthcare systems. “A major reason why the Ebola outbreak spread so rapidly was the weakness of healthcare systems in the region, and it would be unfortunate if underlying causes were overlooked,” said lead author Alexander Kentikelenis. “Policies advocated by the IMF have contributed to under-funded, insufficiently staffed, and poorly prepared health systems in the countries with Ebola outbreaks,” the Cambridge sociologist said. “All these effects are cumulative, contributing to the lack of preparedness of health systems to cope with infectious disease outbreaks and other emergencies,” they write. The current outbreak has killed nearly 8,000 people and affected almost 20,000 so far, according to the World Health Organization. 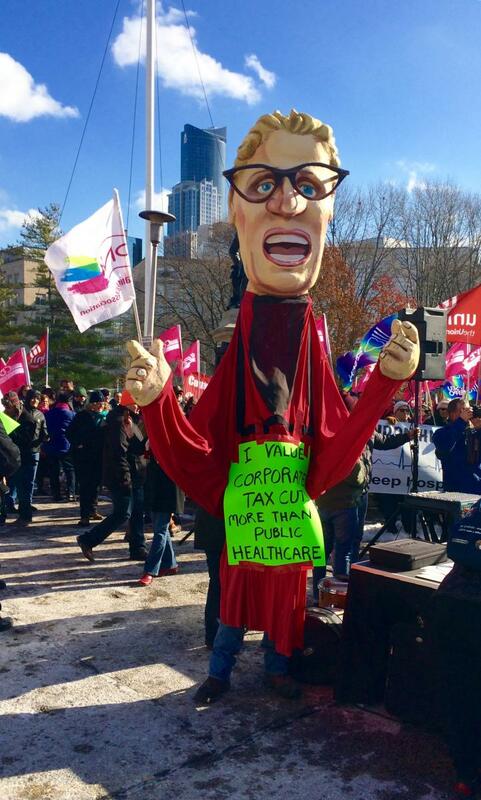 More than 3,000 people turned out Oct. 21 for a Queen’s Park rally and march past some of the biggest hospitals in Toronto, to protest the Wynne government’s drive to close hospitals across the province, privatize the clinics that operate inside them, and allow widespread and illegal extra‑billing for services covered by OHIP. About 20 buses brought protestors from Windsor, Sudbury, Ottawa, Niagara Falls, and other communities in the middle of a cold work day, to express their anger at the Legislature. Torontonians also came to make their views known, loud and clear. Protestors in Toronto. Communist Party of Canada (Marxist-Leninist). Unsafe conditions in the private clinics springing up across the province have recently been exposed. Thirteen percent (one in seven) of private clinics failed mandatory inspections and did not meet minimum healthcare standards. Another 22 clinics (not part of the 13%) received “conditional passes”. The clinics offer cosmetic surgery, colonoscopies, and pain injections, among other procedures. “The percentage of clinics that did not pass inspection without conditions should be setting off alarm bells,” said medical negligence lawyer Paul Harte, in a Toronto Star interview. One pain clinic infected three women with hepatitis C, leaving one permanently crippled and the others with long‑term consequences after spinal cord injections gone wrong. Dirty needles and an anesthetist with undetected colonies of disease on his skin were responsible. Private clinics have been booming since the province began closing public hospitals where many public health clinics for out-patients were traditionally housed. Closing public hospitals and re‑building some as P3s, minus the clinics, has opened the floodgates for the new private clinics. This was clearly intentional by a Liberal government working hard to privatize public assets and services. Liberals have been in government in Ontario since 2003, continuing to carry out the Harris Tories’ plans for P3 hospitals and private clinics, though they were elected to reverse the health privatization plans which were just taking hold 11 years ago. Now, Ontario’s hospitals are funded at the lowest rate of any province. Ontario has the fewest hospital beds per person in the country, and provides the least amount of hospital nursing care. The average patient (average weighted case) in Ontario receives six hours less nursing care than the Canadian average, according to the most recent figures available from CIHI. The government plans to close outpatient clinics, cut chronic care beds by as much as 50% in regions of the province, and cut public hospital surgeries and diagnostics to contract them out to private clinics. Already outpatient physiotherapy and labs have been systematically closed and privatized, and more outpatient services are closing every day. Patients face new user fees for privatized care, amounting to hundreds or even thousands of dollars. Community hospitals will be devastated, after already suffering more than 20 years of almost non‑stop service cuts. Liberal Premier Kathleen Wynne. Council of Canadians. The Communist Party, in a flyer handed out at Queen’s Park, called for a halt to the closure of public hospitals, restoration of P3s into fully public hospitals, and replacement of private clinics with public clinics, located in hospitals and communities, and operated at the highest standards. Hospitals and healthcare must be adequately funded in Ontario, so that beds and staffing are adequate to meet the needs of urban and rural areas. Further, the wages of healthcare workers must not pay for rising costs of healthcare, as suggested by the government’s budget which will freeze public sector wages across the board. The Ontario Health Coalition has more than 400 member organizations, including the CPC (Ontario), and 70 local chapters. Representing more than half a million people, it is one of the most active and effective coalitions in the province, with a mandate to uphold single‑tier public Medicare under the principles of the Canada Health Act. Visit the OHC website at http://www.ontariohealthcoalition.ca or call 416‑441‑2502.